Maxine Walker, from the series ‘Untitled’, 1995. Museum no. E.303-2013. © Maxine Walker / Autograph ABP/ Victoria and Albert Museum, London. Supported by the National Lottery through the Heritage Lottery Fund. Born in 1962, British Jamaican photographer Maxine Walker lives and works in Birmingham. Her photographs raise questions about the nature of identity, challenging racial stereotypes. 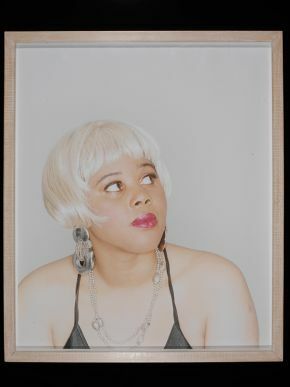 She contests photography’s documentary ability by replicating specific photographic styles, such as in her early series Auntie Linda’s House (1987). Her Black Beauty series from the 1980s and her untitled series for the ‘Self Evident’ exhibition in 1995 both utilise self-portraiture. Display: 16 February 2015 – 24 May 2015. Staying Power: Photographs of Black British Experience 1950s-1990s is a project to increase the number of black British photographers and images of black Britain in the V&A collection. It aims to raise awareness of the contribution of black Britons to British culture and society, as well as to the art of photography.